I was in my friend’s kitchen the other day and heard the sound of his kettle whistling. The crescending sound brought me back to when I was child and this was the one regular sound- a constant soundtrack to our household. It struck me then, how much I miss this sound. That shrill whistle. The one that starts tiny and reaches a maximum high, demanding attention. Like a schoolbell that signals the end of the school day, this instantly recognisable sound is like the kitchen version of Pavlov’s bell. A cuppa is about to be made. I have not had a stove kettle for years now. My kitchen is filled with appliances that make electronic bleeps. The microwave that goes teeeet teeeeet teeeeeet when it’s done with reheating your food, the oven that goes beeeeeeep when your muffins are ready. None with the charm of the stove kettle. Since having dinner the other day, I have had the sound of the whistling kettle in my head and my eye on this little beauty by Alessi. 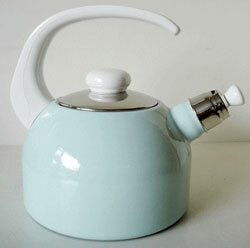 I really like this light blue kettle with white handle. Is this alessi? I can’t seem to find it… Thanks! 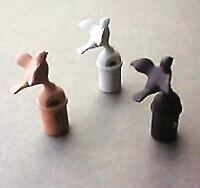 Hey Kristin, the kettle isn’t alessi but the bird whistle is. This kettle is available from http://www.notonthehighstreet.com/lyttonandlily/product/enamel_whistling_kettle_golden_yellow and comes in different colours!